There is a new product that can help you get out and about in the world again, feeling secure and safe while wearing your catheter with a drainage bag attached to your leg. It’s called Freedom Belt™. But assuming you are like most folks and need to go out and about with a leg bag, you face two major concerns. Typically, leg bags are secured to the leg by two stretchy straps at the top and bottom of the bag that wrap around your leg. This is fairly secure until the bag starts to fill, at which point the straps are less able to hold the bag up. As the bag starts to inch down your leg, pulling on the tube above it that attaches to the catheter outlet, one of two things will happen. You either have to empty the bag, or the tube will detach from the catheter outlet with messy and embarrassing consequences as the contents spill out from under your pants! If the tube does not detach from the catheter outlet, there is dangerous pulling on the catheter tube itself. The consequences of pulling too hard don’t bear thinking about. It’s painful, at the very least. At the very least, you need to secure the catheter tube to your body (usually your leg) to help prevent pulling pressure on the tube. I used the Grip-Lok securement stickers for this. But not everyone likes putting stickers on their skin. And after a few days, these stickers start to come loose. So you need to buy a lot of them. And the Grip-Lok only secures the catheter, NOT the bag or the even the bag tube. So even though it’s great for preventing dangerous pulls on your catheter tube, it won’t prevent the leg bag tube from disconnecting from the catheter tube, which can cause embarrassing messes :-P.
Wouldn’t it be great if there were a product that could simultaneously secure the catheter tube AND prevent the bag pulling loose from the tube? The idea is that you have a belt around your waist with straps that hang down, allowing you to attach your bag to the belt. This is incredibly secure! You could probably hang a bowling ball from it. Actually, you could hang SEVERAL bowling balls from it:). 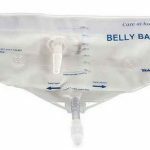 Most folks with urinary catheters only need one bag, but The Freedom Strap can support 8 drainage bags! It works with any drainage bag, including bags made by Merit, Bard, Cook, Coloplast, Medline etc. The Freedom Belt is so new that availability is currently – as of June 13, 2017 – limited. 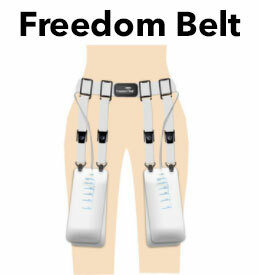 But you can pre-order one now if you go to the website here – https://freedombelt.com. Freedom Belt™ is only $49.95. Hopefully Freedom Belt™ will allow you to get out in the world with your catheter and feel safe, secure and comfortable! The price is $49.95. You can sign up on their page (link in article above) to be notified of details and when they are available. Hi! My name is Jasmine and I work for a large hospital system that is tying to use visual images to improve their response to healthcare alerts for patient care. My nurses really liked the image on your home page and would interested in using it. i would like to speak to you about the possible use of the catheter image [on your home page]. Please feel free to e-mail me at work to discuss in more detail! Thanks so much. Glad you like the image. I created it a few years back and have never had anyone ask me this before :-P. Let me do some checking. I’m sure you can use it. But I need to check with some others on how to handle it. Stay tuned. I understand your concerns. It’s generally wise to conduct due diligence before handing over your credit card over the web. In this particular case, however, I would like to reassure you about all of this. First, I should point out that they do not collect credit card information directly on their site. Everything is done through PayPal, so the financial data is totally secure. I am talking to their customer service as we speak and have verified it. Second, about Dr. Mario being a TV personality – you’re correct about that. Part of being a television personality is to get your message out there to a wider audience than most people can manage. This often involves support for causes, issues and products that you believe in and that you think will help people. I don’t see any reason why that should be cause for mistrust or alarm. And like I mentioned above, The Freedom Belt isn’t just some product that he’s hawking. He and his partners invented that and are putting their heart and souls behind it. Third, I talk to both Dr. Justin and Dr. Mario regularly. They are the two who invented the Freedom Belt and both believe strongly in helping folks with catheters. That is the primary goal here, and the reason why I support them and this product. In this one case, I will ask you to trust me. I promise that if anything weird happens, I’ll take responsibility for it. That is how much I believe in this product. Lastly, you were right about my having the wrong link in there! Fixed Thank you for that!! Thank you very much, Ken! Great follow-up by you, and yes that information helps a great deal! You have an interesting blog, thank you for sharing your experiences. I am Ron, and I am dealing with a stricture myself. 1. My urine stream is weak all the time, but is much worse in the morning. My urine stream is very poor in the morning, to the point where if I wake up with a full bladder, it can take me 90 seconds to empty. During the day, a full bladder takes me no more than 30 seconds to empty. Did you also have very slow urination only after waking up? Is it completely gone now after the urethroplasty? 2. Did you get sudden urges to urinate before the urethroplasty? Sometimes I sit around and just start feeling out of the blue a strong urge to urinate, and I feel like I have to go immediately (it doesn’t come out if I wait, though). It feels as if a few drops start making their way to the tip of the urethra, but never go out involuntarily. It is however causing an urgent need to urinate. 3. I also sometimes feel as if I can almost feel the stricture itself, like something in my pelvic area is getting tight. Sometimes it’s pain, but sometimes it’s just a weird feeling, I feel like I can feel the stricture. Did you get this, too? Thank you very much, I’ll appreciate you answering this a lot, Ken. 1. Though I don’t know for certain why, I definitely had a slow start in the mornings. I actually still do, even though there is no longer a stricture. Maybe it’s just your body being sleepy and sluggish? Something to do with your unconscious mind resisting the constant push from the bladder and that response still sort of lingering. Just a wild guess. 2. I don’t know if I would describe the urge as “sudden” prior to the surgery. But they were definitely strong because they happened much more frequently. The multiple and frequent trips to the potty seemed more urgent. Not sure that helps. 3. Yes. I could feel things happening down there. I even cramped up a few times in the muscles around the sphincter. Very strange sensation. I believe (not certain, again) this was due to the strain on the area from trying to push urine through the blockage. Thanks for the comment, Lesley. I’m glad the site could be of some help. Have you been able to contact Dr. Mario or Dr. Justin about Freedom Belt? You should be able to contact them here: https://freedombelt.com/. If you have any trouble, let me know.